Changing the physical location of your meeting has been proven to impact how the brain thinks and works. A change of environment will increase the rate your brain fires neurons and will improve overall creativity. Shared office space is a really popular trend in today’s start-up community and might provide an enriched environment for your team. There are many facilities that will allow a company to rent office space by the hour. These facilities permit your group to rub shoulders with other entrepreneurs and learn from someone outside the industry. They also allow your team to brainstorm outside of their normal elements which is a great way to foster creativity. Your employees will appreciate the change of scenery and might be able to contribute some of their best ideas in this out of the ordinary space. Many organizations are beginning to recognize the importance of a diverse group when it comes to brainstorming and developing good ideas. The more diverse your group, the more likely you are to come up with an idea that will truly excel. Diversity provides a variety of perspectives and helps the group best anticipate any problems with an idea. Diversity can include different personalities, cultures, positions within the company, or learning styles. Either way, diversity will definitely help you in running effective meetings and developing some of best contributions. On the surface, mood boards might seem like a juvenile idea. However, research suggests that mixing color, imagery, and visual-spatial arrangements is a sure-fire way to spark creativity. It’s also been known to improve memory recall better than more conversational styles of learning. The mood board is a fun and interactive way to bring emotions to the surface. Consider bringing all of the supplies for the mood board and asking your staff to dive in right away. You should leave room for actual discussion towards the end of the project so you can make sure to address your chosen topic, but leave the room open for creativity and expression. Your employees will have fun with the project and you’ll be pleased with the plethora of ideas that evolve from this exercise. One of the best group brainstorming techniques involves playing reverse. For example, if your group is trying to improve customer service within the organization you might begin the meeting by having them share some of their worst customer service experiences. You can take the reverse of these horror stories to establish a list of positive customer service attributes. This is a fun way to get your group engaged from the beginning and will also sparks some interesting conversation. Another great way to facilitate a brainstorming session is to begin by asking a ton of questions about the topic or problem. This technique is often referred to as “starbursting” and has been proven to foster great ideas. To engage in starbursting, go around the room and have each person ask a question until the group has no further questions. Ask someone to be the “scribe” for the session and have them write each question on a communal whiteboard or screen. This method enhances productivity because it ensures all aspects of the project are addressed before diving into the solution phase of the project. 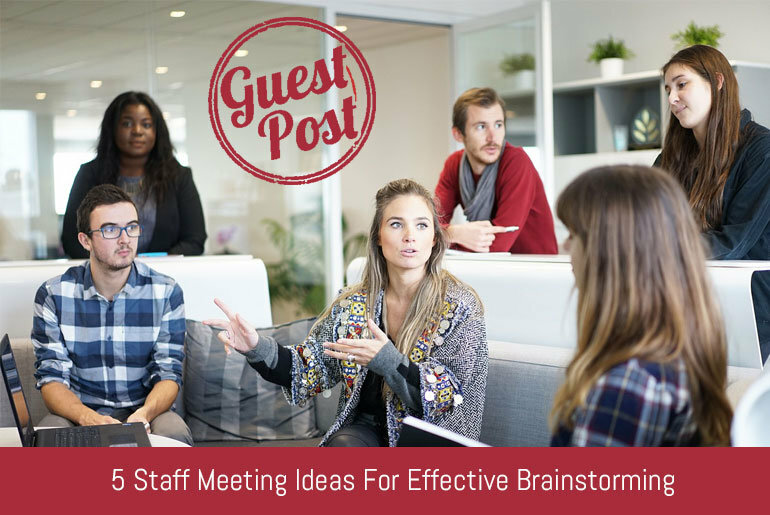 These are just a few of the many ways you can foster a productive brainstorming session with your team. You’ll need to evaluate the personalities in your group and assess which method will work best for your situation. Each idea offers a unique set of benefits and will be sure to lead you to your best work.